Pricing Includes : The "push "n pull" oven stick! You pull the oven rack out with the notch below the 2" mark. You push the rack back in the oven with the other notch located opposite the handle. Straight-line ad copy and 12" scale printed on the front with a stock meat thermometer reading and cooking time scale on the back side and a hole for hanging. Magnets are available for backside at $.10 (G) per stick. Setup Charge : For Custom Logo and/or Custom Typestyle, Add $30.00 (G) per color (for every 3" in length). No charge for straight-line type. Imprint Area : Maximum logo & text height is 1/2". 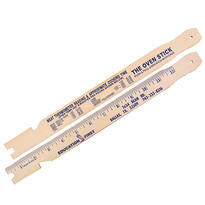 The imprint length is 8" & may include logos as well as custom text. Font choices & sizes vary; some fonts consume more of the imprint area than others. Logos, artwork & special fonts require a die-cut/logo charge, add $30 (G) for every 3" in length. Please contact factory for an estimate. Imprint Colors : Black , Red , Lt. Blue , Med. Blue , Dk. Blue , Lt. Green , Med. Green , Dk. Green , Brown , Purple , Yellow , Teal , Orange , Maroon , Gold , Athletic Gold , Silver. The shade of the imprint may vary because of the grain in the wood; this is the nature of the product. Multi-Color Imprint : $50.00/M (G) or less, per color, per side. No close registration. Shipping Weight : 30 lbs. You First Rush Service : Straight line copy only. No other options available. Maximum Logo Height : 1/2"
Popular Slogans : You won't get burned with... Cooking up Great Ideas For HOT Ideas, Call... We're Pulling for You! Rack Up Your Savings! Push for Quality!